“Britain’s nineteenth-century Arts and Crafts movement had a curious relationship with Victorian notions of social advancement. Whereas proponents of the Industrial Revolution encouraged mechanization and new technology, people in the Arts and Crafts movement looked back to the Middle Ages. Both camps firmly believed in progress—the improvement or even perfectibility of the human condition—yet one group looked to the future while the other favored a return to the past. Arts and Crafts advocates opposed industrialization and factory-made goods on aesthetic and moral grounds: mass production dehumanized workers, and the cheapness of low-quality decorative items encouraged people to decorate their homes with excessive ornamentation. Ironically, although Prince Albert wanted the Great Exhibition to encourage beautiful design, several of the event’s own organizers publicly decried poor examples of design throughout the exhibition. Morris idealized medieval craftsmen, who made their products by hand, and medieval art, which expressed profoundly Christian themes in beautifully designed furniture, textiles, and architecture…” more. The founders of the Arts & Crafts Movement were some of the first major critics of the Industrial Revolution. Disenchanted with the impersonal, mechanized direction of society in the 19th century, they sought to return to a simpler, more fulfilling way of living. The movement is admired for its use of high quality materials and for its emphasis on utility in design. The Arts & Crafts emerged in the United Kingdom around 1860, at roughly the same time as the closely related Aesthetic Movement, but the spread of the Arts & Crafts across the Atlantic to the United States in the 1890s, enabled it to last longer - at least into the 1920s. Although the movement did not adopt its common name until 1887, in these two countries the Arts & Crafts existed in many variations, and inspired similar contemporaneous groups of artists and reformers in Europe and North America, including Art Nouveau, the Wiener Werkstatte, the Prairie School, and many others. The faith in the ability of art to reshape society exerted a powerful influence on its many successor movements in all branches of the arts. The Arts & Crafts movement existed under its specific name in the United Kingdom and the United States, and these two strands are often distinguished from each other by their respective attitudes towards industrialization: in Britain, Arts & Crafts artists and designers tended to be either negative or ambivalent towards the role of the machine in the creative process, while Americans tended to embrace the machine more readily. The practitioners of the movement strongly believed that the connection forged between the artist and his work through handcraft was the key to producing both human fulfillment and beautiful items that would be useful on an everyday basis; as a result, Arts & Crafts artists are largely associated with the vast range of the decorative arts and architecture as opposed to the "high" arts of painting and sculpture. The Arts & Crafts aesthetic varied greatly depending on the media and location involved, but it was influenced most prominently by both the imagery of nature and the forms of medieval art, particularly the Gothic style, which enjoyed a revival in Europe and North America during the mid-19th century. Learn more about The Arts & Crafts movement here. “William Morris was deeply disturbed by the inequities and income disparities he observed in Victorian society. In 1883, he joined the Social Democratic Federation, the first official socialist party established in England. Like many in the movement, Morris struggled to define his vision amid the many competing views on the ideal organization of society. He advocated radical revolution and change through government reform at different times in his life. 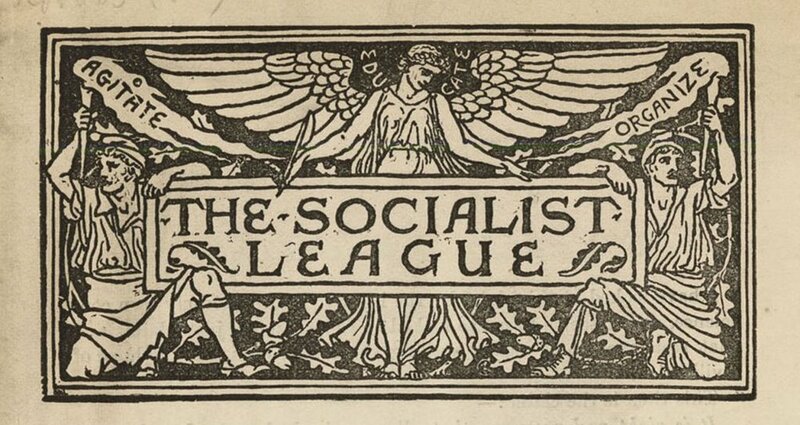 With Eleanor Marx, the daughter of Karl Marx, and other prominent party members, Morris formed the breakaway Socialist League in 1884. Ultimately frustrated by ideological differences between anarchists and reformist party members and exhausted from his relentless schedule, he abandoned all organized political activity in the early 1890s. Morris's enduring contribution to the cause of social equality was largely educational. He financed, edited, and wrote for the Socialist League's monthly publication, Commonweal, and was a popular speaker at party meetings and on street corners where he explained the merits of socialism. Even after resigning his Socialist League membership, Morris continued to champion socialist ideals in his writings and endeavors…” more. "William Morris was a revolutionary force in Victorian Britain: his work as an artist, designer, craftsman, writer and socialist dramatically changed the fashions and ideologies of the era. Morris (24 March 1834 – 3 October 1896) was privately educated before matriculating to read Theology at Exeter College, Oxford, in 1853. He was swayed from his initial intention of taking holy orders by the social commentaries of writers such as Thomas Carlyle, Charles Kingsley and John Ruskin. After university he trained as an architect and developed close friendships with the Pre-Raphaelite artists Dante Gabriel Rossetti and Edward Burne-Jones, with whom he formed a deep and lasting friendship. The two fostered in him an increasing interest in art and architecture. This was the beginning of a remarkable career spanning several disciplines – artist, author, craftsman, and social activist. Morris would become one of the most significant figures in the arts and crafts movement, a man of far ranging creativity and knowledge…” more. ESSAY | Why were the Pre-Raphaelites so shocking? “Pre-Raphaelite paintings are today seen as uncomplicatedly beautiful images. But when they were first painted in the mid 19th century, they were regarded as assaults on the eye, objectionable in terms of their realism and morally shocking. Whereas other artists tended to idealize religious figures, the Pre-Raphaelites painted them with unprecedented realism, detailing peculiarities of physiognomy and character, so people read them in terms of the model rather than in terms of the person that particular model was impersonating. Sometimes the artist’s approach was considered sacrilegious or even blasphemous. In 1848 a group of young artists founded a secret society. “The Pre-Raphaelites” were opposed to the Royal Academy’s promotion of the ideal as exemplified in the work of the Renaissance master Raphael. They were also in revolt also against the triviality of the immensely popular genre painting of time. Inspired by the theories of John Ruskin, who urged artists to ‘go to nature’, they believed in an art of serious subjects treated with maximum realism. Their principal themes were initially religious, but they also used subjects from literature and poetry, particularly those dealing with love and death. They also explored modern social problems. Its principal members were William Holman Hunt, John Everett Millais, and Dante Gabriel Rossetti. After initial heavy opposition the Pre-Raphaelites became highly influential, with a second phase of the movement from about 1860, inspired particularly by the work of Rossetti, making major contribution to symbolism. Learn more about the Pre-Raphaelites, their work, and related terms and concepts here.